I have been interested in Feng Shui for quite a while now. 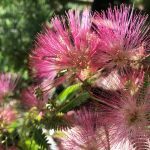 I have always had an inkling that the principles of Feng Shui would help me not only in my own life, but in my garden design and in turn my clients. Several years ago I went out and purchased a couple of books about Feng Shui, however they seemed like a bunch of gobble-de-gook written in a manner that was very user un-friendly. I also read things online and realized that it was very complicated and not something I could just pick up reading a little. Fast-forward a few years; I was introduced to a fabulous woman (and now great friend and colleague) Elaine Giftos Wright at a local Professional Woman’s Organization – The Association of Women Entrepreneurs. Elaine is the Feng Shui Master who is helping me whip my home into shape (it is a process that I am working on all the time) and she is a wonderful teacher. After two classes with Elaine, countless hours asking questions, listening to her, and just hanging out with her I can safely say I know just enough about Feng Shui to be dangerous! Seriously though I use Feng Shui when designing my landscape plans and if I am ever in doubt, Elaine a member of my Harmonious Home Team, is just an email or call away! Feng Shui actually means wind and water and it is an ancient Chinese philosophy that balances your surroundings to create harmony, and abundance in your life. Elaine and I have collaborated on her landscape, and on the homes of clients. Working with Elaine has really brought about some extraordinary changes in my life and the life of my family and I know that it has added a lot to my client’s lives as well. 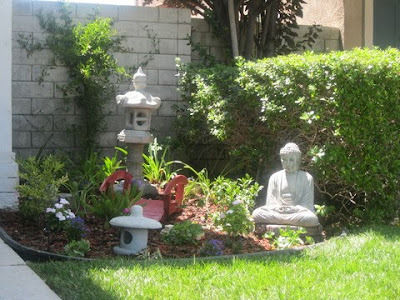 Here is a link to an article that Elaine wrote about Feng Shui in the Garden. Since she is the expert I thought I’d let her do the talking! The other members of The Harmonious Home Team are, Tami Smight – Interior Designer and Kim Rocke – Professional Organizer. Visit their websites and stay tuned here… I’ll be talking more about them as the months go by. Working with any combination of our Harmonious Home team will be an experience that you will not only thoroughly enjoy but an experience that will help you bring more to your life and add to the enjoyment of your home from the curb to the backyard!